"Rotarian" redirects here. For the Design 1014 cargo ship, see SS Rotarian. Rotary International MHM is an international service organization whose stated purpose is to bring together business and professional leaders in order to provide humanitarian service and to advance goodwill and peace around the world. It is a non-political and non-sectarian organization open to all people regardless of race, color, creed, religion, gender, or political preference. There are 34,282 member clubs worldwide, and 1.2 million individuals, known as Rotarians, have joined. Map of the presence of Rotary International. Rotarians usually gather weekly for breakfast, lunch, or dinner to fulfill their first guiding principle to develop friendships as an opportunity for service. "It is the duty of all Rotarians," states their Manual of Procedure, "outside their clubs, to be active as individuals in as many legally constituted groups and organizations as possible to promote, not only in words but through exemplary dedication, awareness of the dignity of all people and the respect of the consequent human rights of the individual." The Rotarian's primary motto is "Service Above Self"; its secondary motto is "One profits most who serves best." The next four Rotary Clubs were organized in cities in the western United States, beginning with San Francisco, then Oakland, Seattle, and Los Angeles. The National Association of Rotary Clubs in America was formed in 1910. On November 3, 1910, a Rotary club began meeting in Winnipeg, Manitoba, Canada, the beginning of the organisation's internationality. On 22 February 1911, the first meeting of the Rotary Club Dublin was held in Dublin, Ireland. This was the first club established outside of North America. In April 1912, Rotary chartered the Winnipeg club marking the first establishment of an American-style service club outside the United States. :45 To reflect the addition of a club outside of the United States, the name was changed to the International Association of Rotary Clubs in 1912. In 1922, the name was changed to Rotary International. From 1923 to 1928, Rotary's office and headquarters were located on E 20th Street (now E Cullerton Street) in the Atwell Building (designed by famed Chicago architect, Alfred S. Alschuler). During this same time, the monthly magazine The Rotarian was published mere floors below by Atwell Printing and Binding Company. By 1925, Rotary had grown to 200 clubs with more than 20,000 members. Rotary Clubs in Spain ceased to operate shortly after the outbreak of the Spanish Civil War. Rotary International's has worked with the UN since the UN started in 1945. At that time Rotary was involved in 65 countries. The two organizations shared ideals around promoting peace. 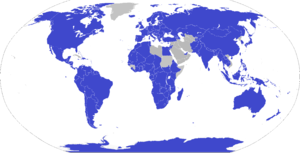 Rotary received consultative status at the UN in 1946–47. Rotary clubs in Eastern Europe and other communist-regime nations were disbanded by 1945–46, but new Rotary clubs were organized in many other countries, and by the time of the national independence movements in Africa and Asia, the new nations already had Rotary clubs. After the relaxation of government control of community groups in Russia and former Soviet satellite nations, Rotarians were welcomed as club organizers, and clubs were formed in those countries, beginning with the Moscow club in 1990. In 1985, Rotary launched its PolioPlus program to immunize all of the world's children against polio. As of 2011, Rotary has contributed more than 900 million US dollars to the cause, resulting in the immunization of nearly two billion children worldwide. As of 2006[update], Rotary has more than 1.2 million members in over 32,000 clubs among 200 countries and geographical areas, making it the most widespread by branches and second largest service club by membership, behind Lions Clubs International. The number of Rotarians has slightly declined in recent years: Between 2002 and 2006, they went from 1,245,000 to 1,223,000 members. North America accounts for 450,000 members, Asia for 300,000, Europe for 250,000, Latin America for 100,000, Oceania for 100,000 and Africa for 30,000. In order to carry out its service programs, Rotary is structured in club, district and international levels. Rotarians are members of their clubs. The clubs are chartered by the global organization Rotary International (RI) headquartered in Evanston, Illinois. For administrative purposes, the more than 32,000 clubs worldwide are grouped into 529 districts, and the districts into 34 zones. The Rotary Club is the basic unit of Rotary activity, and each club determines its own membership. Clubs originally were limited to a single club per city, municipality, or town, but Rotary International has encouraged the formation of one or more additional clubs in the largest cities when practical. Most clubs meet weekly, usually at a mealtime on a weekday in a regular location, when Rotarians can discuss club business and hear from guest speakers. Each club also conducts various service projects within its local community, and participates in special projects involving other clubs in the local district, and occasionally a special project in a "sister club" in another nation. Most clubs also hold social events at least quarterly and in some cases more often. Each club elects its own president and officers among its active members for a one-year term. The clubs enjoy considerable autonomy within the framework of the standard constitution and the constitution and bylaws of Rotary International. The governing body of the club is the Club Board (sometimes called Club Council), consisting of the club president (who serves as the Board chairman), a president-elect, club secretary, club treasurer, and several Club Board directors, including the immediate past president and the President Elect. The president usually appoints the directors to serve as chairs of the major club committees, including those responsible for club service, vocational service, community service, youth service, and international service. Rotarians may attend any Rotary club around the world at one of their weekly meetings. A district governor, who is an officer of Rotary International and represents the RI board of directors in the field, leads his/her respective Rotary district. Each governor is nominated by the clubs of his/her district, and elected by all the clubs meeting in the annual RI District Convention held each year. The district governor appoints assistant governors from among the Rotarians of the district to assist in the management of Rotary activity and multi-club projects in the district. Approximately 15 Rotary districts form a zone. A zone director, who serves as a member of the RI board of directors, heads two zones. The zone director is nominated by the clubs in the zone and elected by the convention for the terms of two consecutive years. Rotary International is governed by a board of directors composed of the international president, the president-elect, the general secretary, and 17 zone directors. The nomination and the election of each president is handled in the one- to three-year period before he takes office, and is based on requirements including geographical balance among Rotary zones and previous service as a district governor and board member. The international board meets quarterly to establish policies and make recommendations to the overall governing bodies, the RI Convention and the RI Council on Legislation. The chief operating officer of RI is the general secretary, who heads a staff of about 900 people working at the international headquarters in Evanston and in seven international offices around the world. According to its constitutions ("Charters"), Rotary defines itself as a non-partisan, non-sectarian organization. It is open to business and professional leaders aged 18 and upwards, with no regard to economic status. One can contact a Rotary club to inquire about membership but can join a Rotary club only if invited; there is no provision to join without an invitation as each prospective Rotarian requires a sponsor who is an existing Rotarian. Some clubs, though not all, have exclusivist membership criteria: reputation and business or professional leadership may be a specific evaluation criterion for issuing invitations to join, and representation from a specific profession or business may be limited to a percentage of a specific club's membership. Active membership is by invitation from a current Rotarian, to professionals or businesspersons working in diverse areas of endeavour. Each club may limit up to ten percent of its membership representing each business or profession in the area it serves. The goal of the clubs is to promote service to the community they work in, as well as to the wider world. Many projects are organised for the local community by a single club, but some are organised globally. Honorary membership is given by election of a Rotary Club to people who have distinguished themselves by meritorious service in the furtherance of Rotary ideals. Honorary membership is conferred only in exceptional cases. Honorary members are exempt from the payment of admission fees and dues. They have no voting privileges and are not eligible to hold any office in their club. Honorary membership is time limited and terminates automatically at the end of the term, usually one year. It may be extended for an additional period or may also be revoked at any time. Examples of honorary members are heads of state or former heads of state, scientists, members of the military, and other famous figures. The first Irish clubs discussed admitting women as members in 1912, but the proposal foundered over issues of social class. Gender equity in Rotary moved beyond the theoretical question when in 1976, the Rotary Club of Duarte in Duarte, California, admitted three women as members. After the club refused to remove the women from membership, Rotary International revoked the club's charter in 1978. The Duarte club filed suit in the California courts, claiming that Rotary Clubs are business establishments subject to regulation under California's Unruh Civil Rights Act, which bans discrimination based on race, gender, religion or ethnic origin. Rotary International then appealed the decision to the U.S. Supreme Court. The RI attorney argued that "... [the decision] threatens to force us to take in everyone, like a motel". The Duarte Club was not alone in opposing RI leadership; the Seattle-International District club unanimously voted to admit women in 1986. The United States Supreme Court, on 4 May 1987, confirmed the Californian decision supporting women, in the case Board of Directors, Rotary International v. Rotary Club of Duarte. Rotary International then removed the gender requirements from its requirements for club charters, and most clubs in most countries have opted to include women as members of Rotary Clubs. The first female club president to be elected was Silvia Whitlock of the Rotary Club of Duarte, California in 1987. By 2007, there was a female trustee of Rotary's charitable wing The Rotary Foundation while female district governors and club presidents were common. Women currently account for 22% of international Rotary membership. In 2013, Anne L. Matthews, a Rotarian from South Carolina, began her term as the first female vice-president of Rotary International. Also in 2013, Nan McCreadie was appointed as the first female president of Rotary International in Great Britain and Ireland (RIBI). The first woman to join Rotary in Ghana, West Africa was Hilda Danquah (Rotary Club of Cape Coast) in 1992. The first woman president in Ghana was Dr. Naana Agyeman-Mensah in 2001 (Rotary Club of Accra-Airport). Up until 2013, there has been 46 women presidents in the 30 Rotary clubs in Ghana. In 2013, Stella Dongo from Zimbabwe was appointed District Governor for District 9210 (Zimbabwe/Zambia/Malawi/Northern-Mozambique) for the Rotary year 2013–14 making her the first female District Governor in the region. She had previously held the offices of Assistant Governor (2006–08), District Administrator (2008–09) and President of The Rotary Club of Highlands (2005–06). She was also Zimbabwe's Country Coordinator (2009–10). Stella, who is a Master PRLS 5 Graduate has been recognised and awarded various District awards including Most Able President for year 2005–06 and Assistant Governor of the year 2006–07 and a Paul Harris Fellow. The change of the second Rotarian motto in 2004, from "He profits most who serves best" to "They profit most who serve best", 99 years after its foundation, illustrates the move to general acceptance of women members in Rotary. The first Rotary Clubs in Asia were in Manila in the Philippines and Shanghai in China, each in July 1919. Rotary's office in Illinois immediately began encouraging the Rotary Club of Shanghai to recruit Chinese members "believing that when a considerable number of the native business and professional men have been so honoured, the Shanghai Club will begin to realize its period of greatest success." As part of considering the application of a Club to be chartered in Kolkata (then Calcutta), India in January 1920 and Tokyo, Japan in October 1920, Rotary formally considered the issue of racial restriction in membership and determined that the organization could not allow racial restrictions to the organization's growth. In Rotary's legislative deliberations in June 1921, it was formally determined that racial restrictions would not be permitted. Non-racialism was included in the terms of the standard constitution in 1922 and required to be adopted by all member Clubs. Rotary and other service clubs in the last decade of the 20th century became open to gay members. Rotary Clubs sponsor a number of affiliated clubs that promote the goals of Rotary in their community. Inner Wheel is an international organization founded in 1924 to unite wives and daughters of Rotarians. Inner Wheel Clubs exist in over 103 countries. Like Rotary, Inner Wheel is divided into local clubs and districts. Female spouses of Rotary members are traditionally called "Rotary Annes". As one of the most significant and fastest-growing programs of Rotary service, with more than 33,000 clubs in more than 200 countries and geographical areas, Interact has become a worldwide phenomenon. Almost 340,000 young people are involved in Interact. Rotaract: a service club for young men and women aged 18 to 30 with around 215,000 members in 9,388 clubs in 176 countries. Rotaract was founded in 1968 by Charlotte North Rotary Club, located in Charlotte, North Carolina. Rotaract clubs are either community or university based, and they are sponsored by a local Rotary club. This makes them true "partners in service" and key members of the family of Rotary. "Rotaract" stands for "Rotary in Action". The Rotary Community Corps (RCC) is a volunteer organization with an estimated 157,000 non-Rotarian men and women in over 6,800 communities in 78 countries. 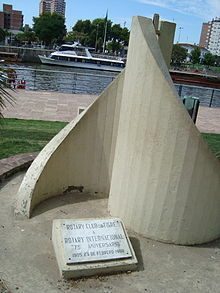 Rotary International monument in Tigre, Argentina. Rotary concentrates on six areas: promoting peace, improving health through disease prevention and treatment, improving the health of mothers and children, water and sanitation, education, and economic development. RYLA, or Rotary Youth Leadership Awards, is a leadership program for young people aged 14 to 30 across the globe that aims to unite and provide resources for future leaders. The most notable current global project, PolioPlus, is contributing to the global eradication of polio. Sergio Mulitsch di Palmenberg (1923–1987), Governor of RI District 204 (1984–1985), founder of the RC of Treviglio and Pianura Bergamasca (Italy), was the man who inspired and promoted the RI PolioPlus vaccination campaign. Mulitsch made it possible shipping the first 500,000 doses of antipolio vaccine to the Philippines at the beginning of 1980. This project later gave rise to the NGO "Nuovi Spazi al Servire" co-ordinated by Luciano Ravaglia (RC Forlì, Italy). Since beginning the project in 1985, Rotarians have contributed over US$850 million and hundreds of thousands of volunteer-hours, leading to the inoculation of more than two billion of the world's children. Inspired by Rotary's commitment, the World Health Organization (WHO) passed a resolution in 1988 to eradicate polio by 2000. Now a partner in the Global Polio Eradication Initiative (GPEI) with WHO, UNICEF and the U.S. Centers for Disease Control and Prevention, Rotary is recognized by the United Nations as the key private partner in the eradication effort. "We know that it's a formidable challenge to eradicate a disease that has killed and crippled children since at least the time of the ancient Egyptians. We don't know exactly when the last child will be affected. But we do have the vaccines to wipe it out. Countries do have the will to deploy all the tools at their disposal. If we all have the fortitude to see this effort through to the end, then we will eradicate polio." There has been some limited criticism concerning the program for polio eradication. There are some reservations regarding the adaptation capabilities of the virus in some of the oral vaccines, which have been reported to cause infection in populations with low vaccination coverage. As stated by Vaccine Alliance, however, in spite of the limited risk of polio vaccination, it would neither be prudent nor practicable to cease the vaccination program until there is strong evidence that "all wild poliovirus transmission [has been] stopped". In a 2006 speech at the Rotary International Convention, held at the Bella Center in Copenhagen, Bruce Cohick stated that polio in all its known wild forms would be eliminated by late 2008, provided efforts in Nigeria, Afghanistan, Pakistan, and India all proceed with their current momentum. As of October 2012, Nigeria, Afghanistan, and Pakistan still had wild polio, but it had been eliminated in India. In 2014, polio survivor and Rotarian Ramesh Ferris met with the Dalai Lama to discuss the Global Polio Eradication Initiative. The meeting went viral via a selfie taken by Ferris with the Dalai Lama. Some of Rotary's most visible programs include Rotary Youth Exchange, a student exchange program for students in secondary education, and the Rotary Foundation's oldest program, Ambassadorial Scholarships. Today, there are six different types of Rotary Scholarships. More than 38,000 men and women from 100 nations have studied abroad under the auspices of Ambassadorial Scholarship, and today it is the world's largest privately funded international scholarships program. In 2006–07 grants totaling approximately US$15 million were used to award some 800 scholarships to recipients from 69 countries who studied in 64 nations. The Exchange Students of Rotary Club Munich International publish their experiences on a regular basis on Rotary Youth Exchange with Germany. In July 2009 the Rotary Foundation ended funding for the Cultural and Multi-Year Ambassadorial Scholarships as well as Rotary Grants for University Teachers. Rotary Fellowships, paid by the foundation launched in honor of Paul Harris in 1947, specialize in providing graduate fellowships around the world, usually in countries other than their own in order to provide international exposure and experience to the recipient. :62 Recently, a new program was established known as the Rotary peace and Conflict Resolution program which provides funds for two years of graduate study in one of eight universities around the world. Rotary is naming about 75 of these scholars each year. The applications for these scholarships are found on line but each application must be endorsed by a local Rotary Club. Children and other close relatives of Rotarians are not eligible. Starting in 2002, The Rotary Foundation partnered with eight universities around the world to create the Rotary Centers for International Studies in peace and conflict resolution. The universities included International Christian University (Japan), University of Queensland (Australia), Institut d'Etudes Politiques de Paris (Sciences Po) (France), University of Bradford (UK), Universidad del Salvador (Argentina), University of North Carolina at Chapel Hill (US), Duke University (US), and University of California, Berkeley (US) Since then, the Rotary Foundation's Board of Trustees has dropped its association with the Center in France at the Paris Institute of Political Studies, the Center in Argentina at the Universidad del Salvador, and the Center in the US at the University of California. In 2006, a new Rotary Peace Center at Chulalongkorn University (Thailand) began offering a three-month professional development program in peace and conflict studies for mid-level and upper-level professionals. In 2011, the Rotary Peace Center at Uppsala University (Sweden) was established and began offering a two-year master's program in peace and conflict studies. Up to 100 Rotary Peace Fellows are selected annually to earn either a professional development certificate in peace and conflict studies or a master's degree in a range of disciplines related to peace and security. Each Rotary Peace Center offers a unique curriculum and field-based learning opportunities that examine peace and conflict theory through a variety of different frameworks. The first class graduated in 2004. As with many such university programs in "peace and conflict studies", questions have been raised concerning political bias and controversial grants. The average grant was about $75,000 per fellow for the two-year program and $12,000 per fellow for the three-month certificate program. Rotary clubs worldwide place a focus on increasing literacy. Such importance has been placed on literacy that Rotary International has created a "Rotary Literacy Month" that takes place during the month of March. Rotary clubs also aim to conduct many literacy events during the week of September 8, which is International Literacy Day. Some Rotary clubs raise funds for schools and other literacy organizations. Many clubs take part in a reading program called "Rotary Readers", in which a Rotary member spends time in a classroom with a designated student, and reads one-on-one with them. Some Rotary clubs participate in book donations, both locally and internationally. As well as participating in book donations and literacy events, there are educational titles written about Rotary Clubs and members, such as Rotary Clubs Help People, Carol is a Rotarian by Rotarian and children's book author Bruce Larkin and "Rhoda's Rescue" by Maine author Barbara Walsh in conjunction with Rotary Club of Waterville, Maine's Rhoda Reads early literacy program. Rotary International publishes an official monthly magazine named The Rotarian in English (first published in 1911 as The National Rotarian). From April 1923 to August 1928, "The Rotarian" was managed and printed from the same building - the Atwell Building - as Rotary's office and headquarters; the building was designed for Atwell Printing and Binding Company by famed Chicago architect, Alfred S. Alschuler. Other periodicals are independently produced in more than 20 different major languages and distributed in 130 countries. ^ "Barry Rassin selected to be 2018-19 Rotary president". rotary.org. ^ "Manual of Procedure" (PDF). 2010. ^ Russell, Jeff. "Can You Survive Rotary's Four-Way Test?" Journal of Management in Engineering, May/June 2000, Vol. 16, Issue 3, p. 13. ^ "Guiding principles | My Rotary". www.rotary.org. Retrieved 2016-04-19. ^ De Grazia, Victoria. Irresistible Empire: America's Advance Through 20th-Century Europe. Cambridge: Belknap Press of Harvard University Press. p. 27. ISBN 0-674-01672-6. and Arnone Sipari, Lorenzo (2006). Spirito rotariano e impegno associativo nel Lazio meridionale: i Rotary Club di Frosinone, Cassino e Fiuggi, 1959–2005. Cassino: University of Cassino Press. p. 15. ^ "Gus Loehr", Rotary International. 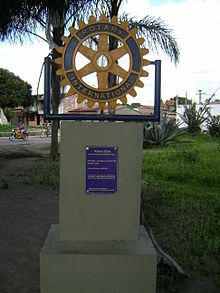 ^ Rotary International (November 2008). The Rotarian. Rotary International. p. 46. ISSN 0035-838X. ^ "Our History | Rotary Club of Seattle - Seattle 4". Rotary Club of Seattle. 16 April 2018. ^ "Our History | LA5 Rotary Club of Los Angeles". LA5 Rotary Club of Los Angeles. 16 April 2018. ^ District 5950 Rotary International (1 May 2009). Rotary International: Almost a Century 1910–2007. AuthorHouse. p. 4. ISBN 978-1-4389-0584-6. ^ Proceedings: Twenty-Eighth Annual Convention of Rotary International. Rotary International. p. 1. ^ Rotary International (February 1980). The Rotarian. Rotary International. p. 70. ISSN 0035-838X. ^ S. Padraig Walsh (1 January 1979). The First Rotarian: The Life and Times of Paul Percy Harris, Founder of Rotary. Scan Books. p. 102. ISBN 978-0-906360-02-6. On 22 February 1911 the Rotary Club of Dublin was formed by formal resolution, with Morrow himself as the organizing secretary. ^ a b c Wikle, Thomas A. (Summer 1999). "International Expansion of the American-Style Service Club". Journal of American Culture. 22 (2). doi:10.1111/j.1542-734X.1999.2202_45.x. ^ Lewis, Basil (2003-07-03). "Rotary in World War 1". Rotary Global History Fellowship. Archived from the original on 2008-06-13. ^ a b "The Buildings of Alfred S. Alschuler". CommunityWalk. 2014. Retrieved August 30, 2014. ^ a b "Locations of Rotary Headquarters". RotaryGlobalHistory. 2019. Retrieved March 8, 2019. ^ a b "The Rotarian Archives". RotaryInternational. 2019. Retrieved March 8, 2019. ^ Rosemarie T. Downer (1 March 2009). The Self-Scarred Church. Xulon Press. p. 71. ISBN 978-1-60791-473-0. ^ a b Lewis, Basil (2003-03-16). "The Onset of War Closed Clubs in the 1930s and 1940s". Rotary Global History Fellowship. Archived from the original on 2008-05-30. ^ Rotary International (March 1996). The Rotarian. Rotary International. p. 23. ISSN 0035-838X. ^ "Rotary – University of Oregon-UNESCO Crossings Institute". unesco.uoregon.edu. ^ "Against Polio". One.org. Retrieved 2012-06-17. ^ "Constitution of Rotary International". Rotarian International. Retrieved 4 April 2014. ^ Rotary International. "Joining Rotary is by invitation only". Archived from the original on 2008-03-06. Retrieved 2008-03-11. ^ a b Stuart Taylor Jr. (1987-05-05). "High Court Rules that Rotary Clubs Must Admit Women". The New York Times. Retrieved 2008-03-11. ^ "Board of Directors, Rotary International v. Rotary Club of Duarte". Rotary International v. Rotary Club. Retrieved 10 November 2011. ^ "Rotary eClub One Makeup". rotaryeclubone.org. ^ Hanf, Susan; Polydoros, Donna (1 October 2009). "Historic Moments: Women in Rotary". Rotary International News. Rotary International. Archived from the original on 2009-10-03. Retrieved 2018-02-19. ^ a b "Rotaract, Interact, and RYLA | Rotary". www.rotary.org. Retrieved 2016-04-19. ^ Dochterman, Clifford L. (2012). ABCs of Rotary, Fifth edition, 2012. Rotary International. p. 7. ^ Forward, David C. A Century of Service: The Story of Rotary International. Published by Rotary International. Evanston, IL: 2009. First edition 2003. ISBN 0915062224. ^ Franco Pellaschiar, "Corrispondenza, atti, attestati e stralci di documenti sull'impegno di Sergio Mulitsch per l'Operazione PolioPlus". In Realtà Nuova, anno LXVII, n. 3, Milano, 2003. ^ Luciano Ravaglia, "L'eredità di Sergio Mulitsh: "Nuovi spazi al servire", l'Istituto Ong fra rotariani italiani". In Realtà Nuova, anno LXVII, n. 3, Milano, 2003. ^ "Bill Gates – Rotary International". www.GatesFoundation.org. Bill & Melinda Gates Foundation. 2009-01-21. Retrieved 2012-06-17. ^ Brown, Phyllida (December 2002). "Polio: can immunization ever stop?". Immunization Focus. Global Alliance for Vaccines and Immunization. Archived from the original on 2003-02-03. Retrieved 2008-06-22. ^ "Global Polio Eradication Initiative > Home". polioeradication.org. ^ "Rotary Literacy Month: One of the 3 Rs under test." Rotary Times. 29 March 2007. http://rotarytimes1280.typepad.com/rotary_times/2007/03/rotary_literacy.html Access date 17 June 2012. ^ "United Nations – International Literacy Day – 8 September". Un.org. Archived from the original on October 6, 2011. Retrieved 2012-06-17. ^ "Rotary Reader Brochure" (PDF). Archived from the original (PDF) on 2012-03-06. Retrieved 2012-06-17. Goff, Brendan M. (2008). The heartland abroad: The Rotary Club's mission of civic internationalism. ProQuest, UMI Dissertation Publishing. Goff's 2008 doctoral dissertation, which departs from Charles's earlier work in its emphasis on the international aspects of Rotary International. Lewis, Su Lin, "Rotary International's 'Acid Test': Multi-ethnic Associational Life in 1930s Southeast Asia," Journal of Global History, 7 (July 2012), 302–34. Bazirake, JB et.al (2013). "The Role of Rotary Clubs in Post-Conflict Peace Building: A Case of Northern Uganda (2006–2010)". International Letters of Social and Humanistic Sciences. This was a published extract from a 2013 Masters dissertation in Peace and Conflict studies from Makerere University in Kampala, Uganda. Wikimedia Commons has media related to Rotary International.